Before you read this, know that everything is okay. Are you scared? Heh heh. 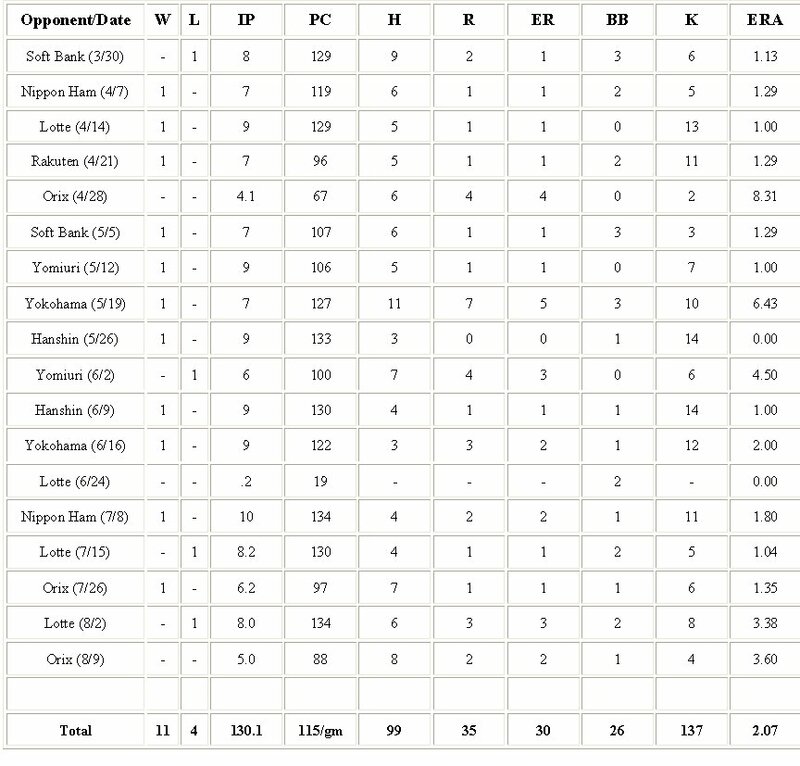 The latest turn in the rotation for Daisuke Matsuzaka didn't go as planned. In fact, nothing was as planned all week, leading up to the August 9th game against Orix. DM's routine was altered for the first time this season, as he chose to pitch a bullpen session one day before his start. Seibu pitching coach, Daisuke Araki, said that Matsuzaka did this twice last season, but this was the first time in 2006 that he'd done so. Why did this happen? The level of concentration that Daisuke was able to muster was obviously insufficient to achieve his normal level of pitching mastery from the get go. The first two Orix batters reached on singles, and a run was brought home on a sac fly. Fortunately, the ace was able to settle down and get out of the inning with only a run scratched out against him. His teammates had staked him to a 2-0 lead to open the game, so 2-1 still worked in his favor. Everything was kosher for the next three innings, as Orix scattered 3 hits and a walk but were unable to score against Matsuzaka. His typical precision and pace were noticably off, and it's a credit to the young man that he was even able to take the mound. Unlike recent starts, DM's Seibu teammates were able to get runners aboard and drive them home to the tune of a 3 run top of the 3rd. Back to back home runs by Alex Cabrera and Tsuyoshi Wada fueled the offense. The 5th inning was a bit of an adventure as the light-hitting #9 hitter, leftfielder Shimoyama, hit a solo shot to make the score 5-2. 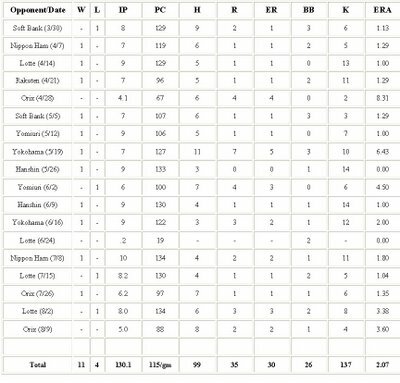 The Buffaloes really made Daisuke work with a few long at bats and a couple of singles mixed in. The illness combined with the effect of his medication hampered his ability to focus as it turns out in post-game interviews and he was forced to take himself out after the 5th with a 3 run lead. If you look at his numbers, it's actually incredible that he was able to perform as well as he did. His start looks a lot like what Roger Clemens has been doing in his 2006 return to the Astros. 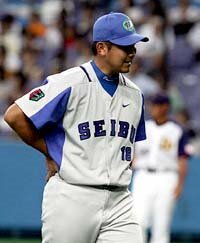 Matsuzaka apologized after the game to his teammates, coaches, and fans for his condition and the early departure. In Japanese culture, this sort of apology is common, as you can witness in Hideki Matsui's apology for breaking his wrist. How much do you think it will cost to sign Matsuzaka ? the speculation i've been hearing is 30M to win posting.. and THEN 55M for 5 year.... that's about wooping 17M year ... that's a bit too over. 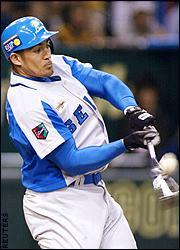 I'd start at 20 million to talk with Seibu, with a ceiling of 30. Then, with Boras as his agent, I think you'll see about 10 million a year for 4 or 5 years. Let's call it 25 million, plus 40 million over 4. 16 million a year on average. The thing is, the revenue generated by Japanese media and marketing will help offset the Seibu money a bit. In the end, after 4 years+, you'll probably actually make that Seibu money back and then some. But, as I said, I have no idea.